GARDAÍ IN WEST Dublin are urging drivers to report suspicious activity following a number of robberies from taxi drivers and delivery drivers over the Christmas period. TheJournal.ie understands that there have been three such incidents in the week in the Tyrellstown and Clonee areas of west Dublin – however just two have been reported to gardaí. Most of these incidents have occurred when the taxi has been hailed using a phone app. 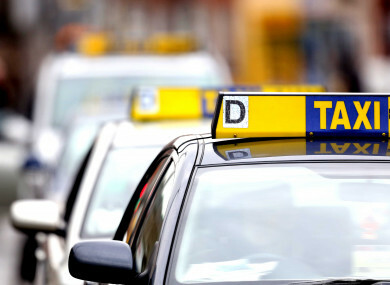 Gardaí believe that the gang picks its target by constantly hailing cab, thereby allowing them to get an older driver. A driver’s photograph is typically displayed on the phone app when they are en route to pick up the fare. Taxi drivers have been targeted a number of times in the last two years in this area. One of the drivers was using a dashcam and was able to upload the footage of the robbery and send it to gardaí. The footage shows three young men in the car. The last frame of the incident shows the alleged thief in the front seat removing the camera. What the man did not know was that the footage was already uploaded to a cloud server and the driver was able to retrieve it. During this incident, the thieves made off with the dashcam itself and the driver’s phone as well as his cash takings for the night. Taxi drivers have regularly been targeted in that area. In a fourth incident, gardaí are investigating a robbery of a delivery driver. This incident happened in Corduff Park in Blanchardstown. Drivers, in the past, have been using WhatsApp groups to communicate with other drivers and gardaí when they have picked up a suspicious fare. When drivers feel unsafe, they are able to send their location to a messaging group. Gardaí are then alerted, as well as taxi drivers in the area, who search for the roof sign number of the driver in trouble. Gardaí confirmed they are investigating the latest robberies. A spokeswoman said: “Gardaí are investigating a robbery from a taxi at Littlepace Road Clonee D15 on 30 December. “The driver was allegedly threatened with a knife by a male passenger who demanded cash. Investigations are ongoing. This time last year, TheJournal.ie reported that a group of young men were carrying out similar crimes. On New Year’s Eve 2017, a driver was threatened with an imitation firearm and robbed in the Hazelbury Park area of Clonee, west Dublin. The driver, although shaken, got to Blanchardstown Garda station where he gave gardaí a statement. Fine Gael’s Noel Rock, has said he has written to both the National Transport Authority CEO and the Minister for Transport to urge them to trial incentives to assist taxi drivers with the cost of installing safety devices such as CCTV dashcams and protective screens in their cars. Rock said: “There is no question that more taxi drivers are being attacked than ever before, which is alarming. It’s a difficult job and it can also be a dangerous job. It’s my belief that we should be working to ensure the safety of drivers as well as passengers. Email “West Dublin gang using hailing apps to target older taxi drivers”. Feedback on “West Dublin gang using hailing apps to target older taxi drivers”.